I have the veg version of that cookbook out from the library right now and am planning on buying it soon. It’s amazing. 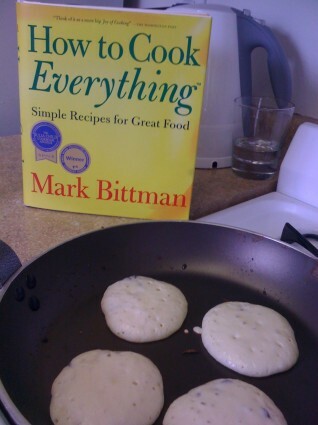 I love his lists of “now you can cook this–here are 12 variations.” I heart Mark Bittman. Too little baking soda. Probably needs baking powder instead. Make regular pancakes and put yogurt on top. Skip this recipe. Yikes, these pancakes are sour! I added some baking powder as I’ve never used a pancake recipe without it. 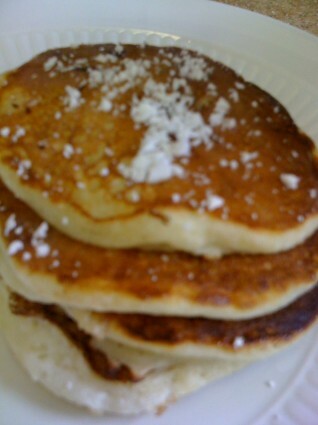 They are indeed light and fluffy (so much so its hard to use a knife to put any butter on them). I’d stick with buttermilk pancakes next time, as I don’t buy pre-sweetened yogurts. The souffle-like texture made them difficult to cook, in my experience. Too thick so the outsides would brown, but the middle was raw. It took a lot of work to adjust the temp of my stove to get them to cook evenly and thoroughly.